Jannike completed a 3-month placement at MER as part of her work experience placement year, having completed the first 2 years of her degree in the UK. MER allowed her to participate in projects in a different environmental setting compared to the UK. 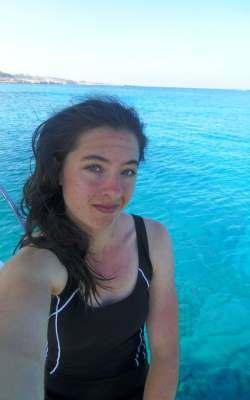 She familiarised herself with the major marine ecosystems and typical fauna and flora of the warm waters of the eastern Mediterranean and gained experience by working with an internationally diverse team. While at MER she worked both in the field and the lab on a variety of projects including RELIONMED, RECONNECT, Paralimni Marina Environmental Baseline Survey, undertaking diving work, sediment and water sampling, macrofauna sorting, biodiversity surveys and quantification of litter along transects. In the lab she filtered water for chl. a estimations, prepared tissue for DNA analyses and carried out aging, morphometric and weigh measurements of Posidonia oceanica samples. Some of the highlights of her placement included co-authoring a Risk Assessment on Torquigener flavimaculosus (based on the EU Regulation 1143/2014 on invasive alien species), and participating in scientific missions carried out jointly with other researchers from Spain, India and Greece, diving with the Department of Fisheries and Marine Research and attending a Maritime Environmental Forum, organised by Frederick University. Following the placement, she intends to finish her degree and pursue a career involving scientific diving and future research into invasive species and the ecology and oceanography associated with them.